JOHN PURSER was born in Glasgow of Irish parents in 1942. He was educated at Lathallan School and Fettes College, and in 1963 took diplomas in Composition, Singing and Violoncello at the Royal Scottish Academy of Music and Drama, wher﻿e his composition teacher was Dr Frank Spedding. With the aid of a Caird scholarship, he continued to study composition with Sir Michael Tippett and Dr Hans Gál. As a mature student he took a 1st in English Literature at Glasgow University (1980), followed by a PhD (1989), partly funded by the Carnegie Trust. In 2009 he was awarded the degree of Doctor Honoris Causa by the University of Aberdeen. He has been a free-lance composer, cellist, musicologist, critic, poet, playwright and broadcaster, as well as lecturing on classical music for many years for the Glasgow University Extra-Mural Department (as it was then called), and has lectured and broadcast on Scottish music world-wide. He was the first Manager of the Scottish Music Information Centre 1985-1987 and was joint editor with James MacMillan of Stretto magazine. More recently, Purser studied Gaelic at Sabhal Mòr Ostaig (the Gaelic College on the Isle of Skye) where he has assisted in course development. In 2006 he was appointed as a Researcher and was Gaelic Music Course Director there from 2006-2008. 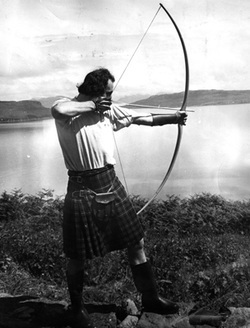 He was one of the team of researchers for the research project, “Window to the West – towards a redefinition of the visual within Gaelic Scotland”, funded by the AHRC. In 2007 he completed an expanded and up-dated edition of his book, Scotland’s Music and a series of 50 radio programmes on the same subject, for BBC Radio Scotland. In 2009 he published a critical biography of Erik Chisholm. Purser lives on the Island of Skye where he and his American wife, Barbara, are crofters. He was Chairman of the local Common Grazings Committee from 2003-2010 and Vice-Chairman of the Strathaird Community Association, 2004-. He was Secretary of the Elgol and Torrin Historical Society 1996-2002 and Secretary of the Strathaird Management Committee, 1995-2001. He was a Trustee of The John Muir Trust from 2001-2004. The sections on WRITING and on MUSIC, with their sub-sections, list Purser's creative output along with related reviews and comments. According to Timothy Neat, he has been "Long regarded as an iconoclastic rogue,"
1991 Giles Cooper Award for the best radio plays for 1991 for Carver. 1976 Scottish Arts Council New Writing Award for The Counting Stick. 1962 Royal Philharmonic Society composition Award. 1963 Radio Eireann Carolan Prize for Variations on Amhran Dochais. 1966 Irish Government Prize for Epitaph 1916. 1993 McVitie’s Scottish Writer of the Year Award for 1992-1993 for Scotland’s Music, (Mainstream 1992). 1993 Sony Gold Medal for Specialist Music Programme on radio for The Temple Of Apollo. 1991Glenfiddich Living Scotland Award for reconstruction of the Carnyx. 2001 SciArt Award as Coordinator of Kilmartin House Museum archaeo-musicological studies and reconstructions. 2010 Scotland’s Fiddle Piobaireachd Vol.1 nominated for a Grammy award, 2010. 2011 Winner of “Folk – traditional recording” category, the Wammies, 2011. 1993 Highland Music Balnain House 1993 - ? 1994 A Cry of Prayer/Eigh Urnaigh Sabhal Mòr Ostaig Lecture (video). 2005 The Storr Unfolding Landscape, consultant and performer. Radio Programmes – Music - UK Unless otherwise stated, all the programmes below were researched, written and presented by John Purser. The main producers have been Robert Crawford (The Silver Chanter and A Change of Tune; Martin Dalby (Scotland’s Music 1991-92 and Composer of the Week) and David McGuinness (Scotland’s Music 2007). 2010 Bonnie and John, April 15, Week 15. 2011 Harlaw Scotland 1411, October 06, Week 40. 1995 In Search of Eden 4 x 30’ Written/presented by John Purser: Recorded and Produced by Susan MacKay 25.6.1995 - ? 1996 Between Two Worlds 7 x 30’ Written/presented by John Purser: Recorded and Produced by Susan MacKay 18.8.1996 – 29.9.1996. 2002 (bronze age horns and vocals) Old to New, prehistoricmusic.com. 2002 (bronze age horn and cello) RTE award-winning programme of Michael Holohan’s and Paul Durkan’s A Snail in my Prime. 22.3.2002 First broadcast 25.12.2000. Cape Town, Chasing A Restless Muse, lecture-recital for South African College of Music, 20.7.2010. Dublin, Yeatses, Pursers and Jelletts, Fourth International John Butler Yeats Seminar, 10.9.2010. Edinburgh, Scottish Literature and Music: A Bardic Inheritance, the 2nd Tannahill Lecture, National Library of Scotland, 10.2.2011. Inverness, "An Uamh Binn - The Sweet-sounding Cave: a musical artefact in context" Underworld Seminar, Highland Council Chambers, Inverness, 27.4.2013 - with Dr. Graeme Lawson. Glasgow, The Philosopher’s Opera, paper read in absentia at Musica Scotica Conference, 27.4.2013. 1969 John Purser talks to John Currie, Scottish Opera Magazine Autumn 1969, pp.4-8. 1992 Interview/Profile with Jim Gilchrist “No Injury To The Ear”, In: Cencrastus No.43 Autumn 1992, pp13-14. 1993 John Purser talks to Elizabeth Alley, The Arts Interview, Radio New Zealand Concert FM, 9.00-9.30, a.m., 9.10.1993, repeated 6.10.1994. Published in The Music of Scotland University of Waikato Scottish Studies Association, Avizandum Editions, No.2. pp1-6. 1993 John Purser talks to Mike Hight, The Radio Waikato Interview, Radio Waikato, 10.00-11.00 a.m., 11.10.1993. Published in The Music of Scotland University of Waikato Scottish Studies Association, Avizandum Editions, No.2. pp6-16. 2006 RTÉ lyric Fieldwork, John Purser interviewed by Michaél O’Suilleabhan, broadcast 27.8.06. 2007 Lynne Kennedy “Profile – Music runs through his veins”, In:, West Highland Free Press, 27.6.08, p.5. 2009 “Scotland’s Music” (Interview with “Iain Gunn” = Bruce Stannard) Scots Number 46, pp.64-69.